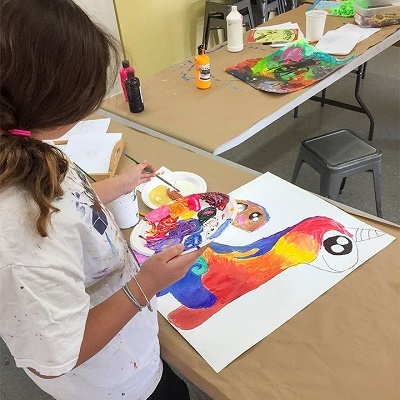 In addition to the fun, children will learn about art, artists and the fundamentals of drawing and the principles of painting. The students will enjoy exploring their creativity in an artistic environment surrounded by art and real artists! Drawing, Painting, and Self Expression for teens that love art, and serious teens interested in building a portfolio. The class is specifically designed to accommodate teens that are looking for a category that meets their needs (too old to be with a younger group and too young to be with adults). We will explore the fundamentals of art and learn basic techniques to learn how to draw. Teens will be encouraged to tap into their creativity and express their imagination freely. We will explore subject matter, such as realism, abstraction, expressionism; we will learn about art history's influence on today's modern artists. Each student will be led based on their own personal interests, needs at their level. Download materials list here. If you have a passion for fashion and want to learn how to design and draw beautiful fashion images – this is the class for you! Students will build a basic art and design foundation including figure and facial proportions. The students will work in various mediums such as paint, watercolor, plaster and so much more to create eye catching fashion designs. At the end of every class they will have a completed fashion project to bring home! Students begin by learning the basics of fashion rendering and illustration, as well as learning fun facts about famous fashion designers and fashion history. Fashionistas are led, step by step, through an art and design curriculum that will leave them inspired and excited about fashion illustration. Put your design skills to the test in a fun environment learning a variety of art-making skills. Students will work with different media like paper, glass, textiles, plaster, paints, found objects to create their own handmade artwork like beautiful books, glass mosaics, embroidery and much more. Let's discover the magic and fun of kiln-fired clay! From slipping and scoring to coil, slab, and pinch techniques, firing and glazing, this class works with it all! Youth Ceramics will teach your child the wonderful world of pottery through various hand-building techniques and creative projects. Join a creative environment where both child and parent/caregiver can explore the world of art together. A variety of visual art techniques and media will be introduced such as drawing, painting, collage, printmaking, crafts and sculpture. Young artists will get familiarized with different materials to explore their creativity while bonding with their parent/caregiver. Students will learn how to take better photos using their smartphone and/or iPad. They will learn how to use fun apps to turn their photos into photo paintings that will wow their friends and family. At the end of class students will create a mixed media photo creation using photo markers, paint, and ink to bring home. Class limited to 6 students. ✵Members save 10% for a year on tuition. click here for membership information. There is also an option to purchase the membership while registering for a class.